We all have the iconic image of climate change ingrained in our minds: a lonely polar bear standing on a piece of broken-off ice while he floats into the open ocean. 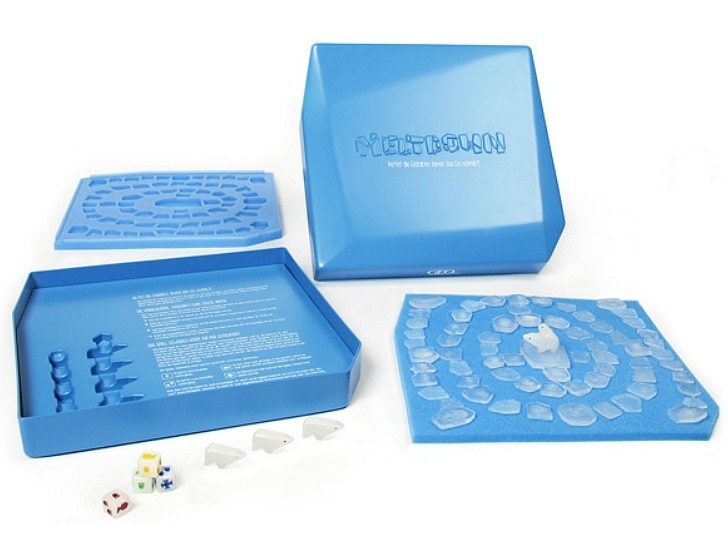 Now that depressing (yet true) image is an interactive game for kids called Meltdown. Designed by GEOlino, a science magazine for children, and design agency Kolle Rebbe, Meltdown teaches kids about climate change in an easy-to-understand way. The game comes with a sponge board and an ice cube tray for kids to make their own Arctic scene. With a roll of the dice, kids and their parents try to save the polar bear family from the melting ice — literally. We wish the solution to global warming and preservation of animals’ natural habitats were similarly at our fingertips. Though Meltdown isn’t available for sale right now, GEOlino and Kolle Rebbe are looking to manufacture one in the future. You can stay up-to-date by e-mailing them here. Check out Meltdown in action in GEOlino’s video. We all have the iconic image of climate change ingrained in our minds: a lonely polar bear standing on a piece of broken-off ice while he floats into the open ocean. Now that depressing (yet true) image is an interactive game for kids called Meltdown. Designed by GEOlino, a science magazine for children, and design agency Kolle Rebbe, Meltdown teaches kids about climate change in an easy-to-understand way. The game comes with a sponge board and an ice cube tray for kids to make their own Arctic scene. With a roll of the dice, kids and their parents try to save the polar bear family from the melting ice -- literally. We wish the solution to global warming and preservation of animals' natural habitats were similarly at our fingertips. Though Meltdown isn't available for sale right now, GEOlino and Kolle Rebbe are looking to manufacture one in the future. You can stay up-to-date by e-mailing them here.